As I wrote in a post earlier this year, Chile and Peru dispute the origin of the addictive aperitif known as the pisco sour, the welcome drink at nearly every hotel in both countries. I enjoy both the Chilean and Peruvian versions, but I never expected to read, as I did in yesterday's Huffington Post, that George W. Bush had broken his personal prohibition pledge at the recent Asia-Pacific Economic Cooperation summit in Lima, Peru, with a pisco sour. Tonight, my last in Santiago de Chile before heading north into the Atacama desert for several weeks, I enjoyed a fish dinner at Ostras Azócar, one of the city's classic seafood restaurants. In tribute to Mr. Bush's rare indulgence of good taste - and his imminent departure from the U.S. presidency - I ordered a Peruvian pisco sour (pictured here). I'll have at least one more on January 20th, unless of course he has the good sense to resign before then, and I'll hope that his long overdue backsliding allows him to enjoy many more in the coming years. Had he continued on this course in his early forties, instead of becoming a 12-stepper (or equivalent), the world might well have been a better place. Too little, too late? By the way, despite what the Huffington Post piece suggests, there is no such thing as non-alcoholic pisco, which is at least 30 to 35 percent (60 to 70 proof) alcohol. In his book Collapse: How Societies Choose to Fail or Survive, UCLA geographer Jared Diamond uses Rapa Nui (Easter Island) as an example of environmental disaster brought on, at least in part, by overpopulation. 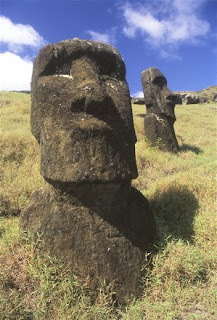 In a 2006 interview with Geographical Magazine, Diamond describes the abandoned quarry of moai (the island's iconic statues) at Rano Raraku (pictured here) as suggesting that "You get the sense that you've walked into a factory, and at 11.59 a.m. the whistle blew, everyone dropped their tools, went for lunch and never came back." This he attributes to environmental degradation on an island of only 171 square km (66 sq miles) ,with a population of 15,000 that denuded once dense forests. Diamond makes a strong case for his thesis, though it's arguable that the island's dysfunctional politics - a priestly class that demanded the construction of the moai and their platforms, and used timber to move them into place - keeps this from being an issue of population alone. Today the island has only about 4,000 residents, whose livelihood depends on tourism and subsidies from the Chilean government, and it still has environmental problems. In the 2007 calendar year, according to statistics provided me by the Chilean tourism agency Sernatur, more than 50,000 visitors landed at the local airport - more 12 times the island's population. In this context, Chilean and local authorities have begun to monitor visits to archaeological sites such as Rano Raraku ever more closely, but one thing remains out of control: this subtropical oceanic island has, according to numbers I heard, as many as 10,000 horses - more than two per resident - further denuding the island's already impoverished flora. Whether or not those figures are accurate, the accompanying photograph, also taken at Rano Raraku, suggests how destructive the horses have been. They are also devouring the reeds in Rano Raraku's crater lake and, as they gallop through the moai "nursery," are likely to do far more damage to the statues in situ than any well-monitored tourists are. It’s not me, as I’ve just returned from Rapa Nui (Easter Island, about which I’ll write more in the coming days) to Santiago de Chile. My 20-year-old daughter Clio, though, has written me from southernmost Patagonia, where her progress has been slowed partly by her learning the ropes on her first major trip to southern South America, partly because public transport connections are less than perfect (she spent a night sleeping in the bus terminal at Río Gallegos, Argentina), and partly because public workers’ strikes have slowed the crossings on the Chilean side of the border (in one instance, she had to wait five hours to cross from Chile into Argentina). It’s also because the buses from Puerto Natales (Chile, pictured above) to El Calafate (Argentina) have been so full that she had to wait several days in town to get a seat - which suggests that, despite the global economic crisis, Patagonia remains a hot destination. For my part, I’ll soon be heading north into the Atacama desert, as I prepare the upcoming third edition of Moon Handbooks Chile. The southern summer is approaching - temperatures in Santiago reached the eighties today and, after midnight, it’s still warm here. Because of the cool Humboldt current, though, coastal Atacama remains relatively mild, and other key destinations, such as San Pedro de Atacama, are high enough that they cool off at night, even though the days can be warm. At 9:10 a.m. this morning, Santiago time, LAN Airlines flight 841 lifted off for Rapa Nui (better known to English speakers as Easter Island), and a little after 1 p.m. (local time), I walked down the gangplank (yes, they still use gangplanks here) at Hanga Roa’s Aeropuerto Mataveri for, if I remember correctly, the sixth time in nearly 20 years as a guidebook writer. For most people, this is a once-in-a-lifetime trip, but I feel privileged to be able to return at least every third year. Over a distance roughly equal to that from Boston to San Francisco, the flight west from the mainland takes nearly six hours, but there is a two-hour time difference with the Chilean mainland. After a brief rest at my hotel, set out to walk around the verdant Pacific island village (pictured above), update the map in my book, and get some lunch on a pleasantly cool, slightly breezy day. LAN is the only airline serving Rapa Nui, though there have long been rumors of competition. Just a few years ago, there were perhaps three flights per week from mainland Chile here, en route to Tahiti, but now there are nine, some of which turn around immediately - that is, Rapa Nui, with its famous moai monuments, has become a destination in itself, rather than just a refueling stop en route to the South Pacific. According to official statistics, more than 32,000 visitors came to the island between January and August of last year - about eight times the population of Hanga Roa (the only significant settlement on the island). Hanga Roa has roughly 600 hotel rooms and 1,300 beds, so the island lives and dies with tourism with increasingly upscale options - most notably Explora’s new, all-inclusive Posada de Mike Rapu on the outskirts of town. The traditional Hotel Hanga Roa is a construction site in the process of reinventing itself as a spa resort. Yet by the standards of South Pacific islands, accommodations here are remarkably affordable - as little as US$20 per person for a plain but decent double room, and even less for tent camping. Yet the price of food has risen dramatically - a quick look around town tells me restaurant prices have nearly doubled since my last trip in 2005, and it's hard to find a good restaurant entree for less than about US$15. Nearly everything must be imported, and pressure on local services has risen as well - in fact, one local hotel manager told me, health, education, and other social services are near collapse despite the tourism boom. Two nights ago, I went to see the new James Bond flick, Quantum of Solace, and in fact it's not a very good movie. It's excessively violent, the plot is full of holes, and Daniel Craig is no Sean Connery or even Pierce Brosnan - the ironic humor of their efforts is almost totally absent. That's not to say it isnt' worth seeing - though I might recommend waiting until it appears on DVD - but that's because of my own interest in the film's portrayal of Chile, where substantial parts of it were shot. When director Marc Forster was filming in and around Antofagasta earlier this year, he drew protests from some sectors of Chilean society because Chile was used as a stand-in for Bolivia (in the late 19th century, in fact, this was part of Bolivia until Chile's victory in the War of the Pacific). This is still a touchy topic, especially among strident Bolivian and Chilean nationalists. As I wrote in the earlier post referenced above, the main Chilean locations were the Cerro Paranal observatory, the coastal ghost town of Cobija, and the aging rail junction of Baquedano (pictured here), along the Pan-American Highway. The mayor of Baquedano was in fact arrested when he drove onto the set to protest the fact that Baquedano was being used to represent Bolivia (anybody mistaking a Bond film for reality perhaps should be in custody, or even in a straitjacket). I have heard of no such protests in Panama, which the film used as a stand-in for Haiti. What I found more interesting was that the film's villain, Dominic Greene (portrayed by French actor Mathieu Amalric), is a gangster posing as an environmental philanthropist. Most Chileans, I'm sure, will take the movie in stride as fiction. A certain sector, though, is likely to see it as a confirmation of their suspicions of their own foreign environmental philanthropist, Doug Tompkins, who has created a private national park, open to the public, in northern Chilean Patagonia. That would be unfortunate, but unsurprising. Yesterday, around 2:30 p.m., my LAN Airlines flight from Los Angeles lifted off for an 11-hour non-stop - it actually arrived a little early - to Santiago de Chile. If you didn't know any better, though, you might think that the landscape depicted here - the Río Maipo canyon just outside the Chilean capital - could just as easily be parts of Southern California. As I've often remarked, and covered in some detail in other posts, Chile's central valley is a mirror image of California, and the warm autumn Saturday in Los Angeles was almost identical to the mild spring Sunday in Santiago. The sun set much later in Santiago, though. Since I was last here in April, though, other things have changed for American travelers, who can expect to encounter a friendly curiosity for the foreseeable future. Chileans have rarely acted overtly anti-American - even those who were would usually be far too polite to say so - but my cab driver from the airport couldn't wait to ask me what I thought about Barack Obama's election victory. At 6:30 a.m. (1:30 a.m. California time), I was too disoriented to offer anything but platitudes about an event that I'm certain to be asked much more about in the coming days and months. Meanwhile, I'm off shortly to see the new James Bond movie, part of which was filmed in Chile. At this point, I'm more intrigued by seeing Chilean response to a film that depicts parts of Chile as Bolivia; while nobody could ever suggest a Bond film was anything other than fiction, it did raise some local hackles during the filming, as I covered in an earlier post. The winner of yesterday's quiz was Colin Bennett of Santiago, who correctly identified John McCain as having visited Chilean dictator August Pinochet in December of 1985. According to journalist John Dinges, McCain (then a Congressman; he was elected to the Senate in 1986) spent several days fishing in southern Chile before returning to Santiago (pictured here) for a meeting with Pinochet. Dinges's article was based in part on a State Department document, which says, among other things, that McCain compared a conversation with Pinochet as "similar to talking with the head of the John Birch Society," a right-wing extremist organization in the United States. As I'm off to Chile this weekend, I expect to be able to deliver Colin's copy of Moon Handbooks Patagonia to him in person. In anticipation of Tuesday's U.S. election, I am offering one of my periodic quizzes, for which the prize will be a copy of the new edition of Moon Handbooks Patagonia, which came out last month. It will not be difficult - in fact, it should be pretty obvious - so I expect to have a winner soon. It will have to be soon, as I'm due to leave to fly to Santiago to begin updating Moon Handbooks Chile by next weekend. The question is this: which current U.S. presidential candidate paid a visit to Chile's then-dictator General Augusto Pinochet in 1985? The individual in question also visited the farm of Marco Cariola, a former right-wing Senator, in Parque Nacional Puyehue. The trail to Volcán Puyehue, whose lush temperate rainforests were devastated by a spectacular 1960 eruption that left a desert of fumaroles (depicted here) on its shoulder, passes through Cariola's property. Cariola collects a toll for the privilege of accessing the volcano via his farm. Please send your answer to the quiz to the email address in the header above. The first correct answer received will win the book, but previous quiz winners are ineligible. I might add that some people might consider the title of this post misleading, as Parque Nacional Puyehue is part of the "lakes district," rather than Patagonia proper, but there's room for debate as to what constitutes Patagonia. 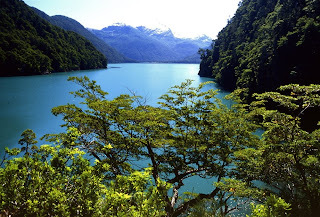 In any event, for purely pragmatic purposes, Moon Handbooks Patagonia includes the lakes district, also known colloquially as the "Sur Chico" ("Lesser South"). Six years ago, in the aftermath of Argentina's unprecedented economic collapse and a dramatically devalued peso, my wife and I bought an apartment in Palermo, one of Buenos Aires's finest neighborhoods. At the time, we thought it was a stretch for us but, with an inheritance and some equity in our California house, it was not out of reach. I don't want to broadcast what we paid for it but, in retrospect, we regret we didn't buy two. Given the depressed peso, quite a few foreigners have bought into the Argentine real estate market since then, with greater or lesser success. I analyzed some of the rewards and pitfalls in Buenos Aires in an earlier post, but that dealt with existing housing. Getting something built can be another issue entirely, as my friend Patrick Symmes, author of Chasing Che, found when he set out to build his dream fishing cabin near the Patagonian town of Trevelin, in Chubut province. In the course of researching his book on Che Guevara's 1950s motorcycle trip through the Americas, Patrick became enamored of the region - and who wouldn't, given landscapes like those of nearby Parque Nacional Los Alerces (pictured above)? The reality of getting his cabin built, though, was a real challenge, as he details in the October issue of Outside Magazine. Anybody considering a similarly adventurous project would do well to read his good-natured, but ultimately serious, account of his experience. The November issue of National Geographic Traveler - for whom I am currently writing a new guidebook to Argentina that will come out next year - has just published its annual "destination scorecard" of historic places around the world. This index rates 109 places according to half a dozen criteria: 1) environmental and ecological quality; 2) social and cultural integrity; 3) condition of historic buildings and archaeological sites; 4) aesthetic appeal; 5) quality of tourism management; and 6) outlook for the future. By these standards, Traveler places Argentina's "Mendoza Wine Estancias" as the tenth-best-rated of 109 destinations, "in excellent shape, relatively unspoiled, and likely to remain so." It describes the city of Mendoza, whose Plaza España is pictured here, as "a pleasant walking city with lots of cultural activities and nice parks," and notes an "amazing number of first-rate restaurants in both the city and countryside." The wineries, meanwhile, come in for similar praise: "The green of the wine estates in the middle of the arid desert is moving. The people are very welcoming, excellent tourist information is available, accommodations range from boutique hotels to simple posadas." At the same time, the "View of the Andes is a great background to the wineries," as pictured here from Bodega Ruca Malén. For a more detailed description of an individual winery, see my Moon Handbooks account of Bodegas Salentein. It's odd, though, that Traveler would describe these institutions as "wine estancias," when in fact they are wineries and vineyards. Widespread throughout Argentina, the estancia is normally a livestock ranch, for beef cattle in the Pampas heartland, and sheep for wool and meat in the Patagonian south. Aside from this odd use of the terminology, though, I concur with Traveler's opinion of Mendoza. In 2004, I made my only visit ever to Antarctica with the Chilean operator Antarctica XXI. 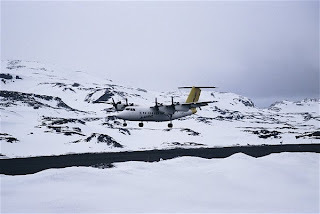 This was a "fly-cruise," including a three-hour flight from the Patagonian city of Punta Arenas, in which passengers landed at the Chilean base at King George Island (pictured here). We then walked from the airstrip to the shoreline to board the chartered Russian vessel Grigoriy Mikheev for a week exploring the Antarctic Peninsula and vicinity. For the 45 or so passengers, this saved a potentially gut-wrenching two-day crossing of the Drake Passage and, instead, let them enjoy sailing through the Peninsula's relatively sheltered waters. According to Mercopress, citing the Punta Arenas daily La Prensa Austral, Chile will soon spend US$9 million to build a new Antarctic terminal at the city's international airport to "confirm Punta Arenas as the real door of access to Antarctica, a condition it disputes with neighbouring Ushuaia in Argentine Tierra del Fuego." While this might sound appealing, Ushuaia is likely to remain Antarctica's "home port" - according to my friend Jeff Rubin, editor of The Polar Times, upwards of 95 percent of Antarctic cruises now leave from Ushuaia. As Ushuaia's a day's sailing closer to Antarctica, Punta Arenas is unlikely to replace it, except for emergency services and the niche market of Antarctic air visitors. Yesterday I got a note from the operator of a small tourist lodge in Tierra del Fuego asking me what I thought the impact of the current global economic crisis might be on this summer's season. On the surface, of course, it makes sense that people whose mutual funds have lost a third of their value might be reluctant to spend money traveling great distances but, at the same time, there's a certain logic in going against the grain. I'd never suggest that people should throw away their retirement funds on a two weeks' vacation but, just as investor Warren Buffett recently said he's moving his money into U.S. stocks because of the financial meltdown, international travelers may find they'll get more for their money in traveling to the Southern Cone countries. That's partly because, against all odds, the U.S. dollar is actually strengthening against the currencies of Argentina, Chile, and Uruguay, and there are other favorable signals as well. When I was last in Chile in April, the peso was at roughly 430 per dollar, and the 2000-peso banknote illustrated here was worth about US$4.65; last Friday, with the peso at 617 per dollar, that same banknote was only worth US$3.24. As in the stock market, there have been some fluctuations, but the bottom line is that the dollar is worth 30 percent more than in April. The case is slightly different in Argentina. When I last wrote about the topic about a month ago, the Argentine peso was only slightly above three per dollar, but now it's above 3.2 per dollar. That's a devaluation of roughly seven percent, but inflation - official figures are unreliable - is likely to eat up most of those gains. In neighboring Uruguay, meanwhile, the peso has lost about 15 percent against the dollar since early September. Another favorable circumstance is that foreign travelers do not pay Chile's 19 percent IVA (Value Added Tax, or VAT) on accommodations - thus reducing the cost of a US$100 hotel room to US$81, for instance. Uruguay already offers a partial IVA refund to foreign visitors who pay their restaurant bills with credit cards, and is considering expanding the measure. Argentina, however, does not do this - in fact, as I mentioned in a recent post, foreigners often end up paying more than Argentines in many cases. In this regard, Argentina's pending imposition of reciprocity fees is a further step in the wrong direction unless accompanied by an IVA policy similar to Chile's that could cancel out the negative aspects. Otherwise, as a US correspondent noted in yesterday's Buenos Aires Herald, "even if tourism levels were unaffected, I would expect that aggregate visitor spending on restaurants, entertainment, hotels, etc. would decline by an amount approximating any visa fee increase." I would go even further in suggesting that, if Argentina persists in its "reciprocity" folly, it might undercut the future for far longer than the current economic crisis. Many of today's backpackers, though their low budgets may make only a minor contribution to the travel and tourism sector at the moment, will eventually be affluent job holders. If a visa fee discourages them from visiting the country now, it'll never occur to them to think about coming back when they're prosperous heads of families. Nearly thirty years ago, when I first visited Argentina during the "Proceso" military dictatorship, an apparently drunken policeman in the Patagonian town of Puerto San Julián insisted in telling me how much he loved Americans. In those days, any such attention from an official figure made you uncomfortable and, as it turned out, the policeman in question was heavily medicated - having literally shot himself in the foot the day before. Fortunately, Argentina is a stable democracy now, but that doesn’t mean the country doesn’t shoot itself in the foot sometimes. Earlier this week, interior minister Florencio Randazzo announced that the country would institute a “reciprocity fee” - similar to the one collected by neighboring Chile - on foreign tourists whose governments impose visa fees on Argentine citizens. This would mean, for instance, that US citizens entering Argentina would have to pay US$131 per person for the right to enter Argentina, while Canadians would pay even more. Australians and Mexicans will pay correspondingly less. This is not unfair, of course. Not only do Argentines seeking tourist visas for the US need to pay the said fee, but they also have to provide bank statements and other supporting documentation to prove they have stable employment and resources for their trip, and that they will not overstay their welcome. An applicant from, say, the southern city of Ushuaia will have to fly four hours to Buenos Aires and then back for a perfunctory personal interview at the US consulate. If the visa is not granted, there is no refund. It’s no surprise that Argentines (and other foreigners) resent the expensive, laborious and almost humiliating process, and many of them consider the new measure long overdue. On the other hand, Argentine tourism operators are up in arms, and rightly so. Their sector has boomed since the 2002 economic collapse made Argentina an affordable destination, but rising international airfares, high domestic inflation, and the deteriorating international economic environment have put their livelihoods - and that of all Argentines directly and indirectly involved in tourism - in peril. Today's Buenos Aires Herald editorializes that the government "now risks discouraging tourism during a global crisis when few enough people feel inclined to travel." The measure, adds the Herald, "is jeopardizing a tourist revenue of potentially billions for the sake of 40 million dollars," the estimated amount of revenue that it would raise. Originally, it was announced that the measure would take effect on January 1, 2009, but there are rumors it may be postponed until March - which would at least give operators one less worry for the upcoming summer high season. The details are yet unclear as well - who will collect the fees and how? Chile, for instance, collects its reciprocity fee only at Santiago’s international airport, as it’s utterly impractical at some remote border posts, so that overland travelers are de facto exempt. Nor is the Argentine measure’s term of validity clear - in Chile, again, it’s valid for the lifetime of the passport, up to ten years. Meanwhile, an apparently impulsive government decision threatens to undermine one of the Argentine economy’s most dynamic sectors. It's fair enough to open fire on a threatening enemy, but it's foolish to shoot your ally, and even more foolish to shoot yourself in the foot. Six years ago, in 2002, I was preparing the first edition of Moon Handbooks Buenos Aires in the midst of Argentina's dramatic economic and political meltdown. In the course of doing so, I paid a visit to a downtown hotel that had had the misfortune to reopen, at this worst possible time, as part of an international chain (not the Sheraton, pictured here). Given its location, barely a block from the chaos of the Plaza de Mayo, and the fact that tourism and business travel had come to a virtual halt, the hotel in question was nearly empty. My story was that I was looking for a place to house my elderly parents, who were coming to visit, and that my small apartment did not have sufficient room for them, but my real purpose was to inspect the hotel anonymously. Normally I would expect the bellman to show me a room or two, and the hotel's common areas, but in this case I was asked to wait a few minutes as the concierge made a phone call. Imagine my surprise when the hotel manager emerged from her office to give me an exhaustive tour of the spectacularly recycled building, a neighborhood classic. Business was so slow that they had to put out every effort to attract even a single guest. When I asked the price, the manager told me it was normally US$100 - in fairness, not an unreasonable price for a hotel of this standard in almost any country in the world - but, she added, "because you're living here, I can offer it for the 'local price'" of 100 pesos - closer to US$30. 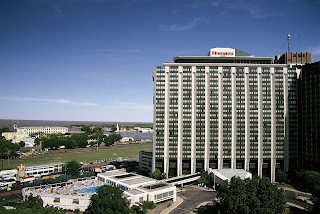 Today, following Argentina's recovery and persistent high inflation, rates at that same hotel start at US$150 plus taxes, and most rooms go for more. This, however, was the first experience I had with "differential prices" which, over the last several years have become a plague and an excuse to rip off foreign tourists even as Argentine prices return to their pre-crisis levels, when the dollar and peso were one to one (at present, the dollar is slowly regaining strength against the Argentine currency). In March, the federal government finally acknowledged the problem by passing a Defensa del Consumidor (Defense of the Consumer) law that prohibits differential rates in hotels and other services, but the problem has not gone away. According to the Buenos Aires daily Clarín, in hotels, restaurants and taxis, services often continue to cost more to the client who's obviously foreign. 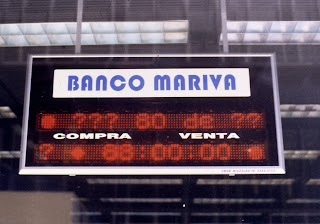 In some extreme cases, advertised peso prices are claimed to be dollars or even euros - three or four times the true cost (Argentines also use the "$" symbol to denote pesos in everyday transactions). One Recoleta artisan quoted by Clarín summed up the problem: "I charge whatever I want, because I'm the one who fixes the value of my labor." Caught giving a discount to an Argentine customer, though, he retorted that "The foreigner has more money than I do." In some cases, it's a little more subtle - when I went to dinner with my Argentine cousin and her husband in the Patagonian resort of El Calafate, for instance, a top restaurant gave us a 20 percent discount because they were locals (even though they're doing very well as freelance guides in Calafate's flourishing tourist economy). The danger of all this, of course, is that foreigners will start to view Argentines as shameless opportunists who will do anything for a peso, dollar, or euro, and decide never to return - and to tell their friends not to bother going. For an individual or a business, overcharging a foreigner has short-term advantages; for the country as a whole, it could be disastrous. In general, prices are still reasonable, but Argentina doesn't need anything that would further erode its competitive advantage in the travel and tourism sector.